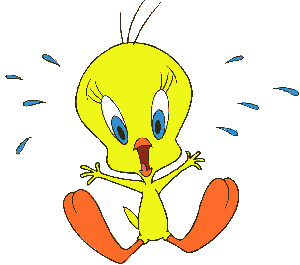 Why call her Twit when you can call her Tweety Bird? My husband affectionately calls me a “Twit.” At least I think it’s affectionate. At any rate, he’s going for the laugh and I’m good with that. Usage of this relatively new term of endearment started about a year ago when I first joined Twitter. What, you wonder, was a forty-something Mom doing joining Twitter? There was a freelance writing gig I’d taken on that required developing an online presence for my client, AND somewhere I heard that it would help my chances of selling a novel if I got more involved in social media. So I jumped into the pool, arms tightly wrapped around myself. At first, I HATED Twitter. I didn’t see the point, despite reading all about how it is good for business and for writers. I read endlessly about it and spent lots of time on it, watching, and doing some tweeting for my client; mostly, I retweeted industry articles, tweeted links to our blog entries, and occasionally engaged in conversation with another Tweep (used by many to refer to people on Twitter; clearly a better term than Twit). On a good day, it was at best tolerable work. A few more times, I reached out to others, responding to their tweets and we had conversations. More people began to follow me. I went on Twitter more often because I liked having conversations that were meaningless but entertaining. I have enough serious in my life and often there is little time to just let off some steam. And while some people find the best way to do that is to go for a run, I’m a highly verbal person. I want to say something. But I’m a little uncomfortable striking up conversations with people in public places, especially if I don’t have something important to say. Writing, for me, is easier. I used to think I’d be set for life if only I could find a high paying job writing personal letters. I wasn’t thinking real time and real short, but still, Twitter is a first step. Now, after taking an amazing online class about branding for writers with social-media-for-writers guru, Kristen Lamb, who firmly urged all 100+ of us in the class to form a Twitter group and talk to each other regularly, I’ve learned that Twitter is much more than I ever thought it could be. Kristen‘s big thing is that writers are isolated due to the nature of our work. She’s created this tremendous network in cyberspace called WANA, which stands for We Are Not Alone, and is meant to be a place where writers can congregate and talk about writing or family or tell jokes or whatever else they want to share. Through this group, I’ve learned about hashtags and social media dashboards and other things that were too scary to figure out on my own. I can talk to my writer friends in a group or I can talk to the bigger world of my followers. I’m still a baby in this environment but for the first time in a long time, I feel constant support from a large network of people who understand what I am trying to do with my life. This week I acquired my 1000th follower. I have to admit that I’m not excited about that because it might help me to sell my book or my freelance writing services. But, I am excited because my world is expanding. There was a woman on my Freshman Hall in college who used to say that she wanted to study the Chinese people, their culture and language because she wanted to know as many people as she could in the world and China had the most people. At the time, I silently laughed at her ambition. I liked her, but her approach and her need to know everyone struck me as silly. But now I understand. There is something truly amazing about talking to people across the country and the world on a regular basis. There is comfort in the similarity of our struggles and joys, and there is value in learning about what makes our lives different. I’m getting an unexpected education that is changing me in what I believe to be amazing ways. Even if I have to put up with some people calling me a Twit. Maybe the picture above will encourage that someone to consider calling me Tweety Bird instead. It sounds like Ladybird and she was smart and shrewd, a woman of substance. Something I aspire to be. By the way, my college friend did become an expert in Chinese culture and I believe speaks the language fluently. I know this not because I keep in touch with her (we went in different directions) but because she is my friend on Facebook—a subject for another blog post. Well you’re talking to someone is not on facebook, who knows nothing about Twitter, I still talk on a dinosaur phone and never had any patience/experience with “bloging” until I met you Sara! I will confess that I just starting “texting” about 3 months ago How is that for a good laugh! I love to poke fun at myself and appreciate the fact the I am extremely old fashioned and ignorant when it comes to technology. When you first sent me an invitation to “blog” with you, I was a little confused. Not quite sure how to do it or more importantly how to respond. I thought “Is this worth my time? Who is reading this anyway?” I don’t like spending time on technology. BUT, to my surprise, I found pleasure in expressing myself with words. After my first blog, I felt very uncomfortable. I thought about all of the misspelled words, poor sentence structure and not to mention the fact that people are going to think I am really weird!! Then I said what the heck?!! Who cares? This feels great!” The world feels a little smaller and and there is personal connection! I get to share with others what I feel is important and make a small difference! No thanks necessary. I am so glad this has been a positive experience for you. My feelings about technology are constantly changing but one thing that I’ve found I like the most is that there are more opportunities to make connections with others, whether it is through blogging or Twitter or Facebook or all those other places I am not familiar with right now. I think that I’m one of those people who thrives on communication with others but is at times too reserved (shy? naaaa) to reach out in person. I’m new to twitter and I do owe that to Kristen’s class. It was always something I was going to do, but last on my to-do list. I still get my twits and tweets mixed up much to my kids amusement, but I’m doing it! I laughed out loud when I read about you worrying about that guy thinking you might be flirting or he might end up stalking you – mostly because I had those same worries when I started out on Twitter! Social media is funny that way – some of the regular rules of socializing don’t apply and then there’s rules unique to Twitter, FB, etc. I’ve made so many social faux pas it makes me blush just thinking about them. We can blush together. I personally think that Twitter is perfect for introverts. It isn’t like introverts don’t have anything to say. They just like to be alone when they say it. Sort of. Your post was a reminder how fortunate we are to have taken on Kristen’s class and joined the WANA revolution. I really thought people who tweeted were on some other wave length before I took the class–it all looked so weird and lame to me. Now, all I have is praise for the doors opened, people ‘met’ and camaraderie achieved. Learning new social media skills is not just nice, but necessary if you hope to sell books that you write at this time. Congratulations on your 1000th follower-quite an achievement. Thanks Cora. And from all of us, thanks Kristen!